Green Bay rumblings: Is Aaron Rodgers part of the Packers problem? The future Hall of Fame quarterback has been largely spared any real criticism even as the offense has struggled. But that is starting to change. The angst in Green Bay is palpable after the Packers’ fourth loss in five games Sunday — a 24-17 loss to the Vikings that dropped Green Bay to 4-6-1 overall and 0-6 on the road. A lot of the hand-wringing and cyber-shouting has been directed at head coach Mike McCarthy, which is both fair and understandable. He’s been the head coach since 2006, arriving in Green Bay at the same time Brad Childress arrived in Minnesota. Any time a coach has been around that long, he is going to have detractors. And while he’s had a good run of success — including one Super Bowl — his decisions as both a head coach and offensive coach have been suspect at times. Future Hall of Fame QB Aaron Rodgers largely has been spared any real criticism even as the offense has struggled. But that is starting to change — which, I have to say, is also fair. Let’s take a look at this from three angles: national, local to Wisconsin and statistical. There is no stat that captures throws that should be made but aren’t, or throws that could have been made on-schedule but were made off-schedule. If these categories existed, Rodgers would have as many as any quarterback, every year. He’s a scintillating sandlot player who goes into sandlot mode way too often. Yes, Rodgers’s unique style, which few QBs have enough talent to call upon, has led to some of his most spectacular plays. But in the aggregate, it also creates the illusion of dysfunction around him. It’s reasonable to keep McCarthy on the hot seat; even with his improved approach, he’s far from flawless. But when evaluating McCarthy, we must admit that his quarterback is far from flawless, too. Just as McCarthy and Rodgers are dialing up winning plays in the early going, their opponents are adjusting and turning the game around in their favor. And then when it’s time for the Packers to answer back, they’ve got nothing. Rodgers takes sacks on third down and misses throws he once made in his sleep. McCarthy counts on backup players pulling off the same assignments his starters did and the blocking breaks down or the routes aren’t run correctly. Afterward, Adams didn’t speak to reporters, which is highly unusual for him and may have been a sign of his growing frustration with everything. Rodgers took some blame but seemed to think he was not the problem. “I missed the one to Davante and threw a no-lace ball to Equanimeous in the dirt,” Rodgers said. “Other than that, I don’t feel like I missed a lot of throws. We just weren’t executing.” That’s right, not executing. That catch-all phrase for being so bad you won’t make the playoffs. Statistically speaking: Rodgers was sacked four times Sunday night, leading to a familiar critique from some Packers fans of the offensive line. But Pro Football Focus has consistently rated Green Bay’s offensive line among the best in the league this season. Two weeks ago, Green Bay was No. 2 in that category. The Vikings, by contrast, were, No. 29. Those stats suggest Rodgers has been cautious with the ball and is holding it a long time — not a bad thing, per se, but perhaps he’s been too risk-averse and not willing enough to cut it loose when he has an opening? The counter to that is that Rodgers’ play could be the result of a bad scheme and/or novice receivers (aside from Adams) not creating separation. 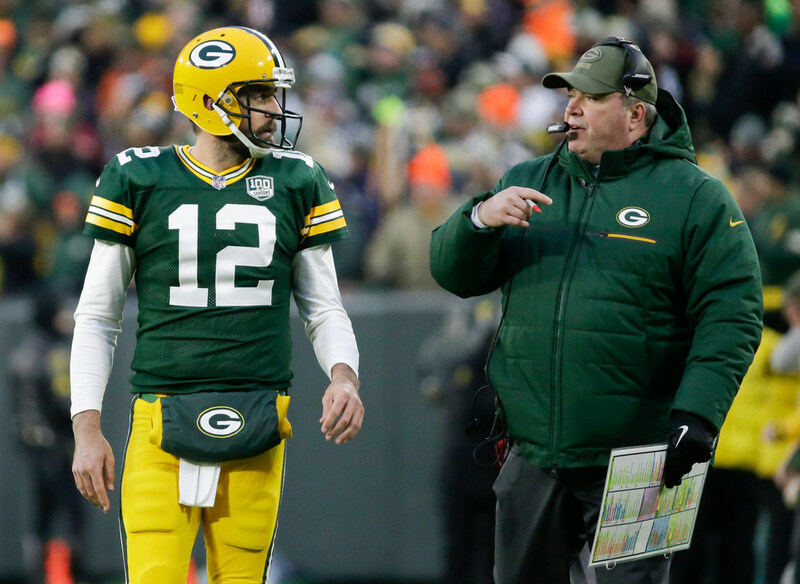 If the Packers don’t figure things out soon and run the table to make the playoffs, it seems likely only one of Rodgers and McCarthy will still be around in Green Bay in 2019. In terms of the split there, it’s a 100 percent chance Rodgers would be the last one standing.